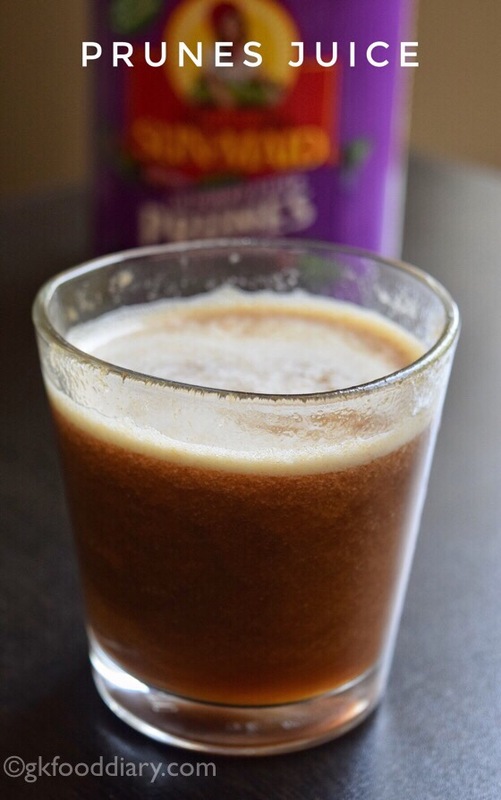 Prunes Juice- healthy homemade juice recipe made with prunes. Prunes are known for its laxative properties, and it works best to relieve from constipation. It can be given to babies in the form of prunes puree or prunes juice to treat constipation. You can give Prunes juice to your baby for 6 months. 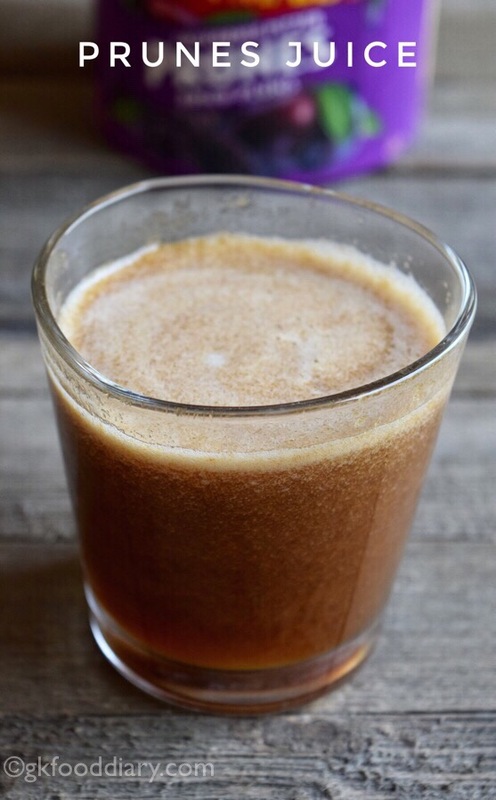 The quantity of prunes juice should be given less (say 2 tbsp to 1/4 cup) when you introduce this juice to your baby as more quantity might lead to diarrhea in some children. Gradually increase the amount (1/2 cup max per day) as per your baby’s tolerance level. 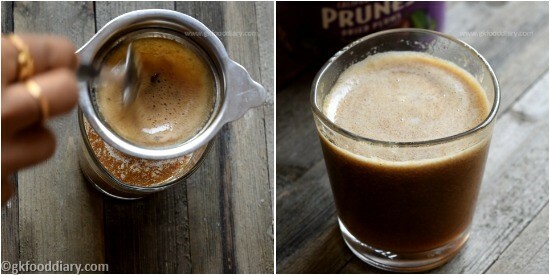 Soak the prunes in ¼ cup of hot water for 30 minutes or until soft. 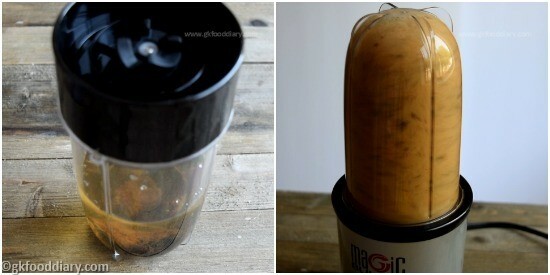 Transfer the soaked prunes to a blender along with the remaining ¾ cup of water. Blend it until smooth. Then strain the juice through a strainer. Slot with a spoon and collect the juice in a bowl. Collect maximum juice as possible by pressing it with a spoon repeatedly. 1. 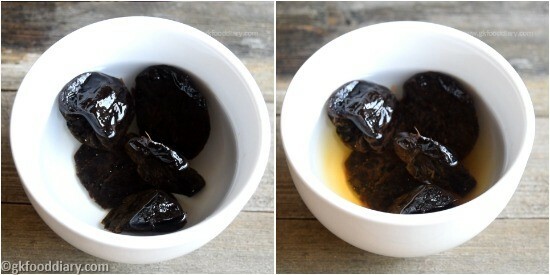 Soak the prunes in 1/4 cup of hot water for 30 minutes or until soft. 2. 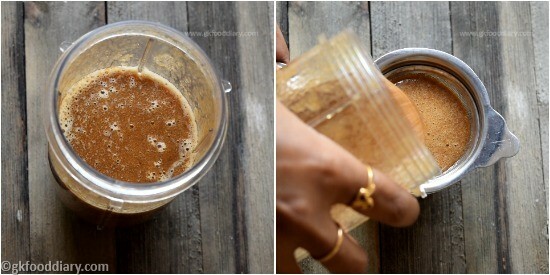 Transfer the soaked prunes to a blender along with the remaining 3/4 cup of water. Blend it until smooth. 3. Then strain the juice through a strainer. 4. Slot with a spoon and collect the juice in a bowl. Collect maximum juice as possible by pressing it with a spoon repeatedly. 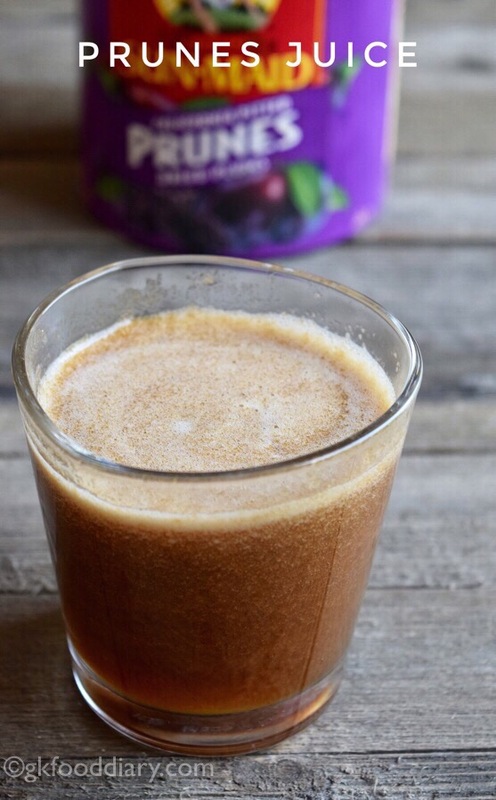 Serve the prunes juice fresh! Collect maximum juice as possible by pressing it with a spoon repeatedly. Add more water if required to reach the desired consistency after straining. 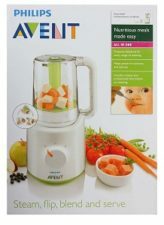 Give only a small quantity when you introduce this juice for a first time, gradually increase the amount once your child’s tummy is adjusted with it. You can add jaggery syrup or palm sugar, cane sugar as a sweetener for babies above one year.